Someone I know just received their black belt in Brazilian jiu-jitsu. It took him ten years, and I'm told this is the typical amount of time it takes in this style. Most martial arts as practiced in the US take about half that time to achieve the coveted black belt. Perhaps BJJ has higher standards or their people want to disassociate with those of the McDojo variety that award black belts at breakneck speed. There seems to be some controversy over the length of time it should take to get to black belt. (A word to the wise: it's not a good idea to ask "how long will it take to get a black belt" at a traditional school.) Isshinryu karate's Angi Uezu says it takes, on average, about two-and-a-half years on Okinawa. 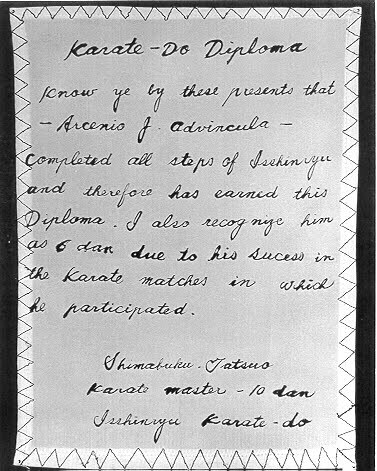 In the All-Japan Karate Federation (formerly, the Zen Nippon Karatedo Renmei), three years is recommended to achieve shodan (1st degree black belt). * It took Chuck Norris fifteen months, kickboxing great Joe Lewis seven months and Isshinryu legend Don Nagle six months to get their black belts while training in Korea or Okinawa during a US military hitch. 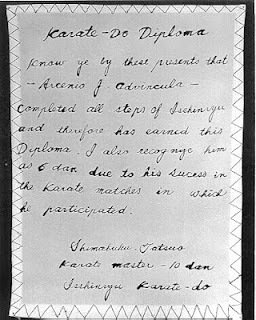 Nevertheless, when the Americans returned to the United States from Okinawa, most did not wait 15 or 20 years, but proclaimed their high grades immediately. When speaking of the duration of white belt to black belt the only relevance is actual training time in the dojo. One source cites that at least 1000 hours of instruction is required for promotion to 1st dan black belt.† If you train 1 - 1.5 hours per class three times a week, that works out to about five years. Norris, who first took up judo in the Air Force and then switched to tang soo do (a cognate of tae kwon do) while stationed in Korea, would train up to thirty hours per week, about double of what most Americans train in a month. Initially, he didn't even think about getting a black belt. Apparently, he figured out something very important: It's the journey, not the destination, that counts. * Richard Kim 1974. The Weaponless Warriors. Ohara Publications, Incorporated. † Jennifer Lawler 1996. The Martial Arts Encyclopedia. Masters Press.